Also named to the 2018 “Oklahoma Super Lawyers” list are: T. Michael Blake, Courtney Bru, Brandon L. Buchanan, Steven W. Bugg, Jennifer H. Callahan, Steven P. Cole, W. Chris Coleman, Richard D. Craig, Robert W. Dace, Bradley K. Donnell, Clifford C. Dougherty III, Bill G. Freudenrich, S. Gregory Frogge, Robert L. Garbrecht, Charles Greenough, Spencer W. Haines, Lauren Barghols Hanna, Lloyd T. Hardin, Jr., Gerald L. Hilsher, Alan G. Holloway, Henry D. Hoss, Michael E. Joseph, Robert J. Joyce, Garry L. Keele II, Michael J. LaBrie, Joe C. Lewallen, Jr., Ronald W. Little, Brandon P. Long, Robert T. Luttrell III, M. Richard Mullins, Richard D. Nix, J. Michael Nordin, John A. Papahronis, Ross A. Plourde, Charles S. Plumb, Frank L. Polk, James C. Prince, Tony G. Puckett, Anthony L. Rahhal, Natalie K. Ramsey, Andrew L. Richardson, Richard A. Riggs, Reid E. Robison, Patricia A. Rogers, Paul A. Ross, Ronald T. Shinn Jr., Barry L. Smith, C. David Stinson, Jeff L. Todd, W. Kirk Turner, Erin M. Van Laanen, Drew D. Webb, Elizabeth Scott Wood, J. Todd Woolery and Harold C. Zuckerman. McAfee & Taft attorneys named to the 2018 “Oklahoma Rising Stars” list are: Michael Avery, Christian D. Barnard, Sasha L. Beling, Elizabeth Bowersox, Matthew K. Brown, Philip R. Bruce, Emily Wilson Bunting, Judy Burdg, Brian A. Burget, John R. Chubbuck, Jodi C. Cole, Jessica L. Dickerson, Jodi W. Dishman, Paige Hoster Good, Danae V. Grace, Stephen M. Hetrick, Sean S. Hunt, Jessica John Bowman, Barbara Klepper, Laura J. Long, H. Cole Marshall, Samanthia S. Marshall, Jason McVicker, Isai Molina, Zachary A.P. Oubre, Julia A. Palmer, Terra Lord Parten, Micah J. Petersen, Dru A. Prosser, Christopher Scaperlanda, Kristin M. Simpsen, Joshua D. Smith, Joshua W. Solberg, Patrick L. Stein, Curtis J. Thomas, Alison A. Verret and Jeffrey L. Vogt. 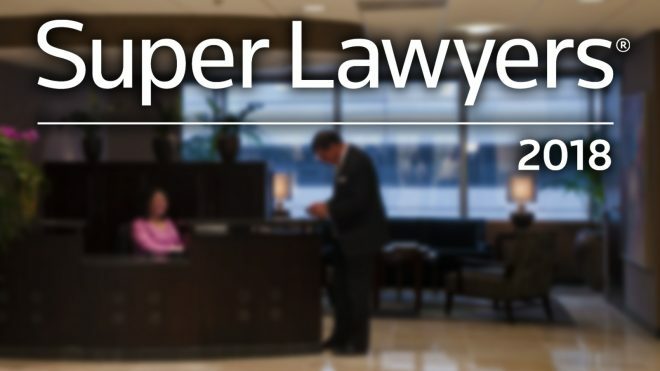 Oklahoma Super Lawyers recognizes the state’s top 5 percent of Oklahoma attorneys in more than 60 practice areas as “Super Lawyers” and the top 2.5 percent of up-and-coming attorneys as “Rising Stars.” Selections for these esteemed lists are made by the research team at Super Lawyers, which is a service of the Thomson Reuters legal division. Each year, the research team undertakes a rigorous multi-phase selection process that includes a statewide survey of lawyers, independent evaluation of candidates by attorney-led research staff, a peer review of candidates by practice area, and a good-standing and disciplinary check.